As a car owner, you know just how important it is to invest in frequent auto repair and maintenance. In fact, you know well enough to understand that not investing in frequent car maintenance and care is a great way to lose money and potentially your call altogether. One of the most important components of your vehicle is the belts, one of which is the serpentine belt. What Does My Serpentine Belt Do? This belt serves the purpose of transferring power to important parts of your engine such as your alternator, air conditioning, and power steering. It helps to keep these parts running efficiently and properly. How Do I Know When To Replace My Serpentine Belt? There are a few telltale signs that it’s time for a new serpentine belt. One of which is a loud squealing sound. This generally means that the belt is slipping due to low tension from normal wear and tear. Over time your tension belt will crack and stretch and depending on where you live, the elements could cause your serpentine belt to crack and stretch much sooner than usual. Not tending to this problem can lead to costly repairs on your engine. How Often Should I Replace My Serpentine Belt? Because serpentine belts are built for long term use, replacing them is not too demanding. Generally, you can expect to get at least 60,000 miles out of your serpentine belt. However, some cars are manually tensioned and will need to be brought into an auto repair shop for adjusting. Keeping the engine of your vehicle is important and you should be paying full attention to the things that your car needs. 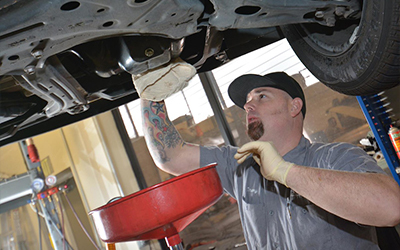 If you’re in need of a belt replacement or auto repair, contact our car service in Folsom and we would be happy to tend to your vehicle.